The Manteca City Council earlier this month considered proposals for a solar project for its wastewater treatment plant that could potentially save the city millions of dollars over the next decade. The 5.5-acre solar array would provide one megawatt of electricity to power a third of the plant, making it the second largest solar installation in south San Joaquin County. The current PG&E utility bill for the wastewater plant is a staggering $1.2 million per year, about a third of the cost to build the solar project at $3.9 million. The Manteca Public Works Department estimates the solar system will have a life expectancy of 25 years and an eight-year payback. For the remaining 17 years, the City of Manteca will receive free electricity for a third of the plant. 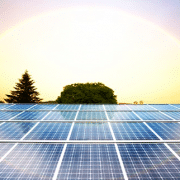 It is proposed that the Sewer Maintenance and Operation fund be tapped for the solar array without a rate increase. Like Manteca, many California communities are taking control of their resources, switching to renewable energy, and saving money. Some local governments have taken full control of their electricity supply through Community Choice Energy (CCE). With CCE, cities such as Manteca could continue building their own renewable assets while creating jobs and building revenue reserves. A recent study that used San Jose as a case study found that even under the most conservative estimate, a CCE that procured local electricity would boost local jobs by over 1,000 per year and local economic activity by more than $12 million. As the shift to renewable energy accelerates, Community Choice Energy will become more attractive to cities such as Manteca. Welcome Sign of Electric Vehicles International, LLC facility in Stockton, California. Recently acquired by First Priority GreenFleet, Ltd.
Named after the lengthy river that runs through it, San Joaquin County was the Valley’s first location where settlers took up permanent residence. With a readily accessible water source, it’s easy to see why it was originally developed for agriculture and ranching. I was born and raised in Tracy (about 30 miles from the County seat of Stockton), and it wasn’t unusual to see cows grazing along town roads as I grew up. Over the past few decades, San Joaquin County has undergone a stark transformation as farms have given way to more homes and businesses. The influx of commercial development is welcomed by residents seeking growth for the local economy, but inevitably demands more resources. As a lawyer with a background in energy and environmental law, I’ve come to appreciate the magnitude of energy needed to power our communities, and energy’s impact on our environment, including air quality. As our communities grow, it’s clear we must innovate to move toward sustainability. 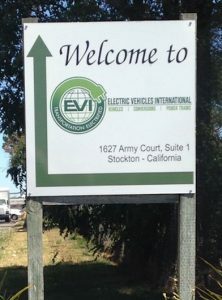 My enthusiasm for green power was “reenergized” when I learned that Stockton will be home to a renewed electric vehicle production facility. First Priority Greenfleet Ltd has acquired the assets of Electric Vehicles International (located in Stockton), and is looking to build and sell hybrid and electric specialty vehicles, including electric school buses. This is particularly significant in light of the up to $1,000,000 recent award from California Air Resources Board to the San Joaquin Valley Air Pollution Control District to make local school buses safer and less polluting. 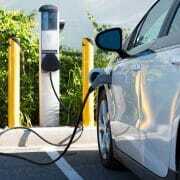 First Priority Greenfleet’s acquisition comes at a dynamic time in the electric vehicle market, as car companies around the world are racing to dominate the commercial and mass market. San Joaquin County is already home to another star-studded electric vehicle maker – Tesla. In 2014, Tesla purchased a 431,000 square foot distribution facility in Lathrop, California. The facility, previously owned by Daimler-Chrysler, is currently being utilized for manufacturing Tesla components. It’s exciting to think of San Joaquin County as a potential hub of energy innovation and greenhouse gas reductions. We’re well-positioned geographically, given our proximity to both the booming Bay Area and to Sacramento, the state capital. Our recent shift toward electric vehicle production is a step in the right direction – proving that communities can reap economic and environmental benefits on their path toward sustainability.